A multi-purpose volumising and texturising powder which assists in the styling of your hair and provides a matte finish. This powder offers versatile control whilst also adding volume and texture. Loved by everyone who uses it, this styling powder allows you to create 'second day' hair effortlessly with light styling control and a buildable hold. Dust It Mattifying Powder can be used to absorb excess shine at the roots and provides a cool, matte finish which accentuates all styles. 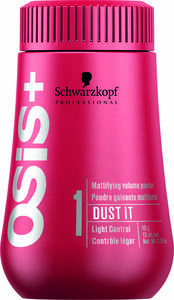 Sure to become a staple in any styling regime, Dust It Mattifying Powder can be used in wet or dry hair and will amaze you at the outstanding volumising and texturising effects it has on all hair types. Directions of use: Apply to dry hair.